The ute market in NZ is on fire. Between SUV’s and utes they now take up over 50% of all vehicles sold. 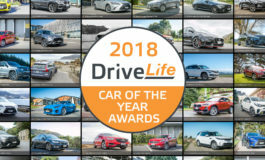 If you’re in the market for a ute, there is a massive array of options – a segment that used to be made up of Ford, Toyota, Holden, Nissan, Mazda and Isuzu. We now have products from Ram, LDV, Foton, Great Wall, Ssangyong, VW and even Mercedes-Benz. But are all these utes just like each other? We take the 2017 VW Amarok V6 Highline and a 1500km road test just to see how tough it is. The Amarok range is pretty big, with 8 model variants available. 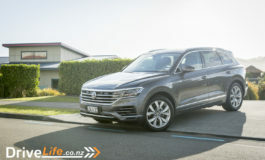 It starts with the 4WD Core TDi (50,900), 4WD Single cab TDI ($57,990),4WD Comfortline TDi ($58,990), 4WD Sportline TDi ($65,990), 4WD Highline TDI ($65,990) 4WD Amarok Canyon Limited Edition ($69,990) 4WD V6 Highline TDI (71,990) and ends with the 4WD V6 Aventura TDI ($85,990). Only the Core and V6 Highline are available in manual and automatic. Both manuals have selectable 4Motion four-wheel drive, while the automatics have permanent 4Motion four-wheel drive. There are two engine options across the entire range. The 2.0L twin-turbo four-cylinder diesel and the 3.0L V6 turbo diesel. 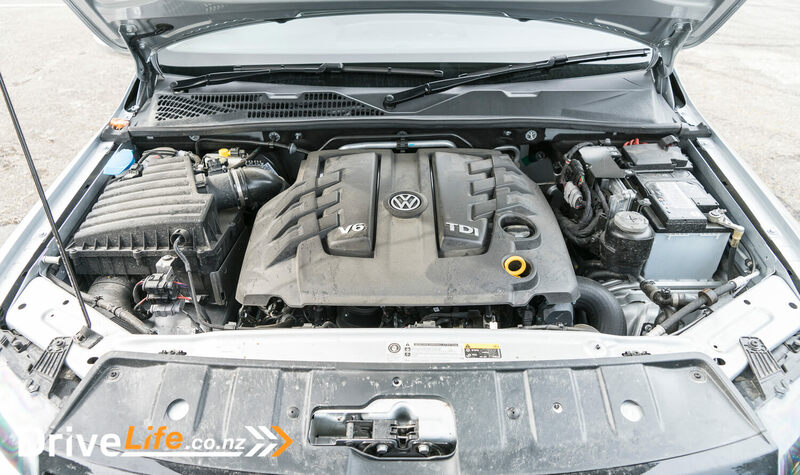 The 2.0L TDI delivers 132kW of power and 400Nm of torque, not bad for a 2.0L. The second option is the 3.0L V6 TDI that delivers 165kW and 550Nm of torque. It also comes with an overboost option which gives the engine an additional 15kW of power while extending the maximum torque delivery for up to 10 seconds. All automatic models come with permanent 4Motion four-wheel drive. The Manual 4WD Core model comes with selectable 4Motion. The 4Motion four wheel drive system can distribute between the front and rear axles 40:60. And when driving on loose surfaces the self-locking Torsen differential automatically distributes power to the driven wheels with the most traction. All Amaroks have two optional spring load systems. The heavy duty 3+2 leaf spring and a 2+1 leaf spring. The 2+1 spring allows for an increased tow limit of 3500kg while the 3+2 spring has a tow limit of 3200kg. The 2+1 spring also reduces the GVM and payload for the cargo area which is 1010 kg compared to the 1041 kg on the 3+2 spring. Either can be selected for any Amarok as a no cost option. 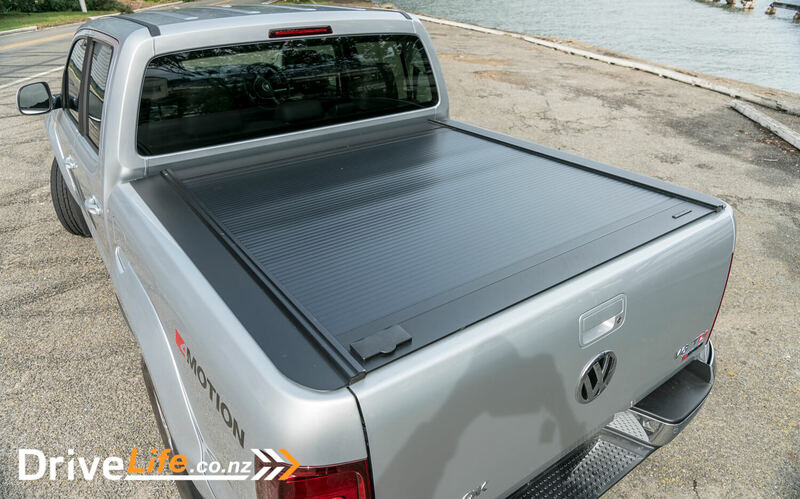 The V6 Amarok Highline comes with a raft of standard options. 20-inch alloy wheels, dual- zone climate control, cruise control, premium multi function display, BiXenon headlights with daytime running lights. You also get auto lights, auto wipers, park distance control front and rear with rear view camera, front side widows in heat insulating glass and privacy glass for rear windows, towbar preparation, stainless-steel nerf bars with integrated steps, UV resistant tray liner and the seats and dash are covered in Alcantara. As for additional options you can select a mechanical differential lock on rear axle, roll cover, matte body paint, floor covering – robust rubber, paddle shift levers and seat covering – ‘Vienna’ leather upholstery in Palladium Black. I was secretly hoping that our test vehicle would be Ravenna Blue Metallic, one of the better colours in my opinion. I found out that this is only available on the Aventura after collecting the Highline, which was silver. It just didn’t make it stand out as much as I would have liked. The Amarok, however, has a really good strong shape, square while not being as straight as a Land Rover Defender. The only thing that I could see that signified this as a V6 model, was the small badge on the front grille and rear tailgate. Again the Aventura spec has more obvious change than the V6 Highline. This vehicle had been spec’d with the roller cover and the deck had been lined with carpet. Not something you see a lot, but apart from that everything else looked like a standard model. Apart from it being silver and not blue, I liked the Amarok, it has a strong and modern presence. 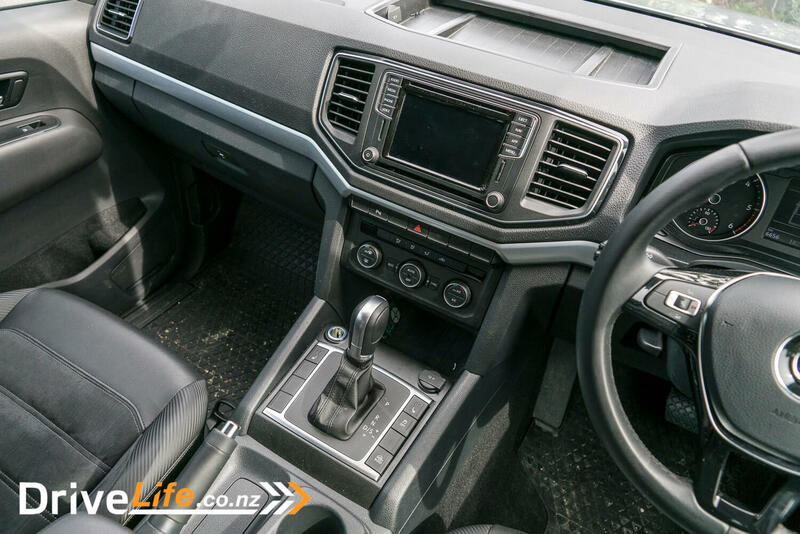 The inside of the Amarok is more like the inside of a standard Golf then a commercial ute. The seats are covered in vinyl and alcantara, which is some fancy material for a ute. And the rest of the interior follows the same theme, nice materials that are usually in passenger vehicles rather then a commercial vehicle. This was a great start, as it’s the one thing I find it hard to deal with when the price tag is on its way to $80k. Back to these seats, I was impressed. During my time in the Amarok I found them to be perfect. I am usually one who prefers leather seats as I find fabric to be too soft and unsupportive. But I did not have any issues with the V6 Highline. In fact now that I think about it, I never had to change or tweak the seats after first jumping in. Super comfy, supportive and great for long trips. Good height too, so your legs never felt too cramped. The cabin itself was pretty clean, some buttons around the gearstick, media screen and an array of 12-volt plug sockets – two beside the gear stick, one on the dash and another for the rear seat passengers. This was really handy for long trips, as you didn’t have to share the plugs and could charge all sorts of devices at the same time. The centre console media screen was the main focus in the cabin and probably the most high tech bit of equipment too. It’s the same tried and trusted system used in all of the VW passenger models, and was super easy to use for paring phone and setting up the nav system. I did feel like it was a bit on the small side, the screen and the surrounding buttons that is. And I say that only because ute drivers sometimes find themselves wearing gloves, and small buttons don’t work well with gloves. The steering wheel was another feature from the VW passenger line up. This has the usual volume, phone, cruise control and menu options you would expect to see at this price – and it didn’t have paddles, well done VW. It must have taken a lot to not just stick paddles on something for the sake of it, especially when you have an 8-speed auto gearbox. rear view camera system. The parking sensors were excellent, and very helpful to gauge where the front of the truck was, due to its sloping bonnet and flat front design. The rear view camera was ok, good clarity but its position on the rear was rather low. The camera had been positioned just under the tailgate and above the licence plate. I can see why it’s there, but I am not sure if it’s the best position for the end user. Where it’s positioned allowed easy visibility to the tow bar when trying to line up a trailer. The down side of this was that the tow bar always took up a decent part of the image. It also allowed you to use it when the tailgate was down. Not sure this would be used a lot, as it was hard to see where the corners of the truck were. I would have prefered if they stayed with the hidden camera behind the VW logo, as in most cases it’s the perfect height and angle to use with wide angle rear view cameras. The other issue I had with the camera or actually the display, was the the parking sensor image overlaid on the left hand side of the rear view camera display. I found this a bit annoying as it made it hard to see when reversing out of parking spaces. I found that I have to look over my shoulder on the right instead of using the camera. I was unable to find an option to turn this off – it may be there, but I couldn’t see it. Jumping back to the tray, VW are proudly advertising the Amarok as having the largest tray in its class. Offering 2.52 metres squared and 1.222mm between the wheel arches, which allows you to load a pallet onto the deck. I was actually surprised that this is not possible in all utes. 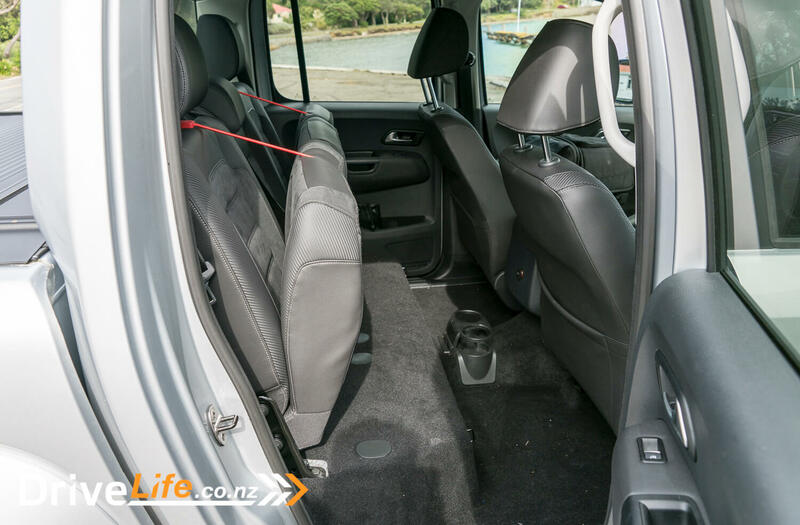 The rear deck’s load capacity is 1,010kg, and has a tailgate that can cope with up to 250kg. Our test model came with a ROC retractable hard lid from RVE and carpet lined interior deck. The deck cover rolled back up into its own sealed box, which had two drainage holes that were connected into the front of the deck, presumably into existing drainage vents. I was dubious about how well it would work in the rain, but after the torrential rain we had in Wellington after arriving back from our trip, I now have 100% faith in this cover. For the money they are asking for this Amarok I was surprised to find push button start and keyless entry not even an optional extra, never mind as standard on the V6 Highline. At close to $80k it seems like a bit of a oversight as the rest of the technology and vehicle has been well thought out. Cabin storage was ok, some space in the centre console, large pockets in the doors, and a recessed tray in the middle of the dash. Plenty of spaces to put things, but not many spaces to put things out of sight. I am not sure if this is a big problem or not, but it was something that bothered me. Yes you could use the glove box, but it wasn’t large by any means. In the rear of the cabin, there are three seats with a 60/40 split in the middle. The space in here was pretty good, even with the driver’s seat set for a tall person. It was not cramped or uncomfortable. The split allowed you to fold up the seats for extra storage space. This didn’t work as well as other utes, as the floor was not flat when the seats were up, so you still have an awkward space to deal with. If the floor had been flat under the seats and foot wells, it would have created a decent amount of practical space. The ties used to hold the seats up were also a bit of an afterthought, and no more than bungee cords. This seems a bit crude and not great for the nice seats and materials they were holding up. The timing of the Amarok review presented us with an interesting opportunity. 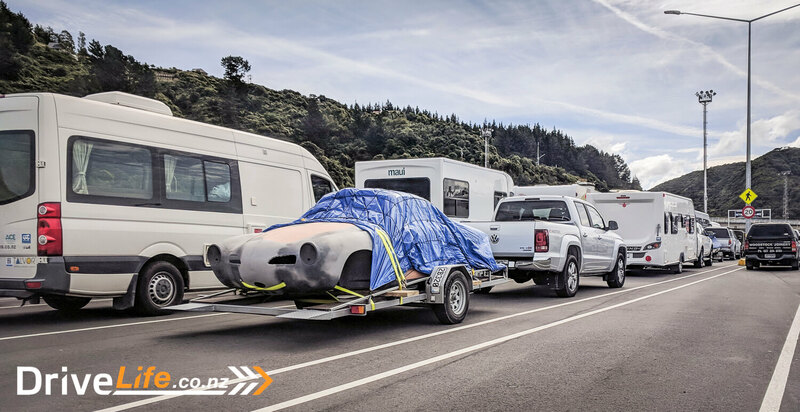 I had already planned to pickup up a vehicle’s body and parts of the vehicle in Dunedin, and trailer them back to Wellington. And as the old saying goes, it can’t hurt to ask, and I did. I ran the idea past the team at VW New Zealand, which they were rather excited about. More so when they heard that the vehicle I would be collecting is a 1965 VW Karmann Ghia which was to be restored back in Wellington. We had a truck, trailer and we knew where we needed to go. The dates available for collecting the vehicle and my co-driver’s spare time meant that we had to do it all over one weekend, leaving on the Interislander on Friday evening, drive down to Dunedin and back to Picton on Sunday before the 2pm sailing. It was a bit of an amazing race but we were both excited about the dramatic distance we needed to cover in such a short time. We booked the Interislander, our accommodation and put our plans together for what would be an 1500km weekend adventure. I collected the Amarok two days before we were to leave on the Ferry. This gave me a bit of time to see what it would be like on the day to day before we started the roadtrip. Right away, you can tell that this is not as pedestrian as other utes. As we covered in the interior, it’s very comfy and refined. But this also extended to the driving experience, the ride was firm but smooth, and that engine was no louder than a diesel car or SUV. Many utes have stiffer suspension to cope with any big loads that may be carried in the rear. Due to this, when empty some utes can be over stiff and uncomfortable, but not the Amarok. If I had been blindfolded and taken somewhere, I may not have realised it this was a ute at all. The feeling while driving the Amarok was oddly familiar. My wife has a VW Golf, so there were many aspects that have been migrated across to the ute platform. Any previous or existing VW owners should feel right at home inside any of the Amarok models. 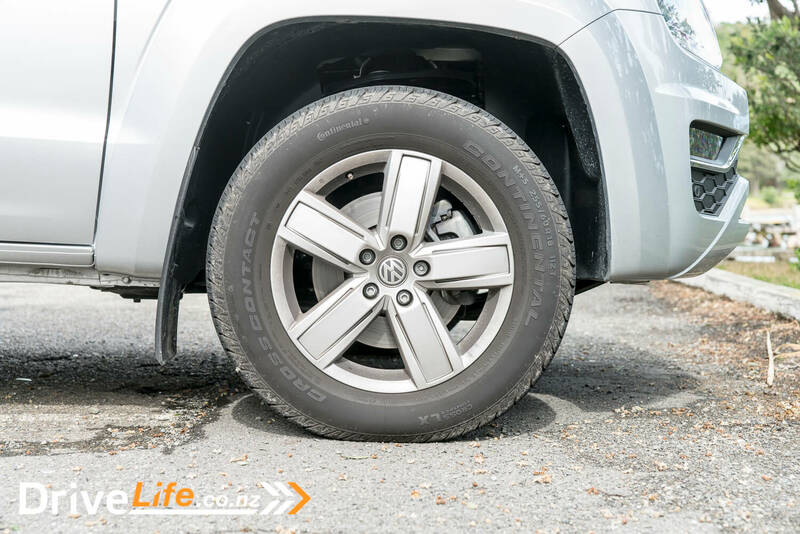 The amazing thing about the Amarok was that it did not feel like a ute – It felt more like a tall car or SUV. The body roll was not as extreme as some other utes. It was not a boat to drive, actually it was rather sharp. 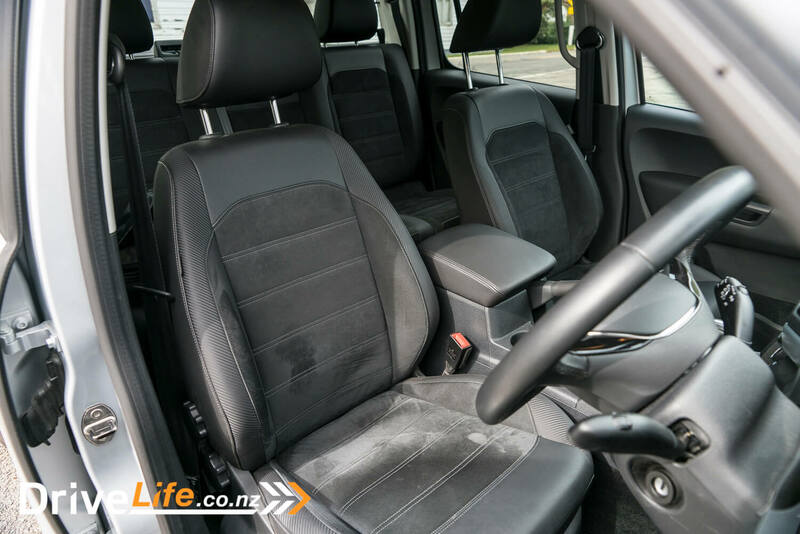 In some ute’s the combination of soft suspension and soft seats result in you holding on to the wheel to stay in your seat as you go around a corner. Not in the Amarok, it was so well planted that you just drove it like you would any other car. This was great for such a big truck, as it gave me the great confidence of driving a car even if you were not used to driving a ute. The Friday evening of our amazing race had arrived. With one stop needed at our storage unit to collect our car trailer, quickly connect it up, test the light and made our way to the Interislander. For the people who know me, I don’t like to be late. But sometimes I can be too early as well, and it looked like we were a bit early as we got to the ferry terminal first, leaving us at the head of the queue to board the ferry. Saturday morning came and we set off at 6am, it was 691 km to Dunedin, and once the vehicle was collected we had to do another 300km to get back to our overnight stop. It would be a long day behind the wheel, and from the start we decided that we would take it in 2-hour shifts. The V6 was a beast, most of the time due to the deck blocking the view of the trailer we couldn’t even see if it was there. I never even noticed a difference when we hooked it up. But the real test would be once we have the trailer and ute fully loaded: how would this 550 Nm feel on the way back? The distance traveled seemed to roll by quickly, two hours behind the wheel, then a swap and two hours as a passenger. We were lucky that State Highway 1 was open, which showed us how much damage had been caused by recent earthquakes. The coverage on the news didn’t really show you how bad it was, as we stared at hillside after hillside that had massive slips showing the fresh soil or rock now visible. After several swaps, we were both pretty impressed with how we both felt. We are not aching or uncomfy at all, and before we knew it, we were already past Christchurch, and it was full steam ahead for Dunedin. The drive continued to be rather undramatic, which was a good thing for the Amarok, both drivers feeling comfortable and confident behind the wheel of this tough truck. We hit Dunedin around 4:30pm, which left us around two hours of daylight to load the trailer and ute. Thankfully we had extra help and before we knew it the trailer and deck of the Amarok were loaded and we were on the road once more. Now we could see our trailer, or at least the load it’s carrying. With everything on there, it must have been around 1500kg, with another 500kg in the deck of the ute. Did we notice it, as we left Dunedin, on its uphill motorway? Not really, we couldn’t tell if it was using a few more rpm, but it felt more like the Amarok was just taking this in its stride. Impressive machine this, and for towing, it’s definitely standing out as the cream of the crop. Much like the start of the day, the road back to our stopover was night driving. The Bi-Xenon headlights were great, especially when there was no traffic around so that we could use the high beams. By this stage we had been behind the wheel for over 10 hours, and neither of us felt any discomfort. Yes we were looking forward to the stopover, as it was a long day, but we both felt pretty good considering. 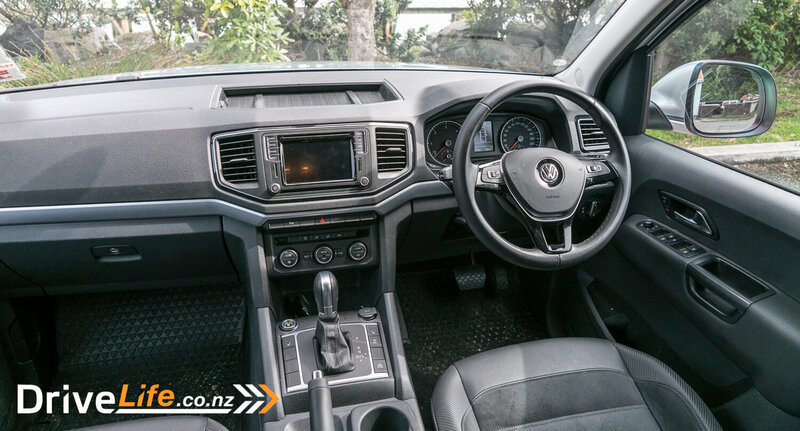 A true testament to the suspension and overall comfort of the Amarok, more passenger car than commercial ute. The next day the trip back to the ferry was not as big as the day before, with only 400km to cover. This would seem easy to do with compared to the 1000km we had completed. Before we knew it we rolled back into Picton with an hour to spare before the ferry would board. One thing that my co-driver and I noticed during the 1800 km trip, was that we did not see that many Amaroks on the roads of the South Island. We saw some in each of the major cities we passed through, but in the depths of the country the Ford Ranger, Toyota Hilux and Isuzu D-max were in abundance. The entire trip was covered with just two tanks of diesel, which we thought was pretty good for the amount of km we covered. The average consumption during this time was pretty good too, not exactly manufacturer numbers but not bad for towing either as we managed 9.5 L/100km. As we crossed the strait we looked back over our 1500km, and were both pretty impressed at how the Amarok handled it. 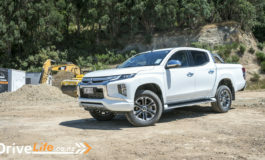 We could both think of a few other utes that would have been less than ideal or more taxing on the body compared to the Amarok. We concluded that, yes it is pricey, but we could both see the value. Not only in the engine but in the entire package. What may have seemed like a novelty market years ago is quickly growing into the latest trend as these utes become easier to live with on the day to day. The Amarok is the most expensive in the group, with only one other V6 ute to choose from. Luxury interior for a ute, Alcantara! I really enjoyed driving the V6 Amarok from Wellington to Dunedin and back again, and to be honest there are not many utes I would want to do that sort of trip in. It’s not perfect, but it’s not far from it either. It tows like a train, has a great, strong look, drives like a car and the interior is nothing like a typical commercial vehicle. The price is steep, I will give you that, but the value is definitely there. This is one tough and serious ute that really stands out from the crowd. If I had to choose any ute to live with, this would probably be the one. Warranty 3 years or up to 250,000km mechanical warranty.